After the very last of my undergraduate classes (an amusing Thursday afternoon section of Art History: the Modern Era in which I stretch my wits to see how much insight I can provide on inconsequential nuances) had ended, a couple of us decided on a whim to go to Montreal. 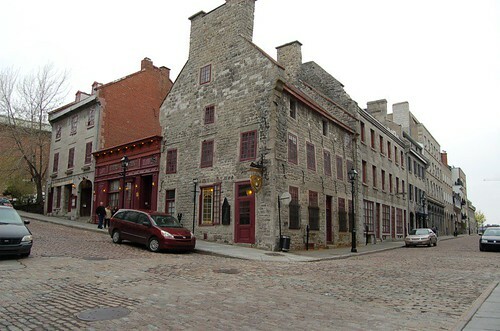 After all, it's "Paris without the jetlag"; surely, I like Paris, and I do not like jetlag, so Montreal it was. This was one of my favorite dishes of the evening. 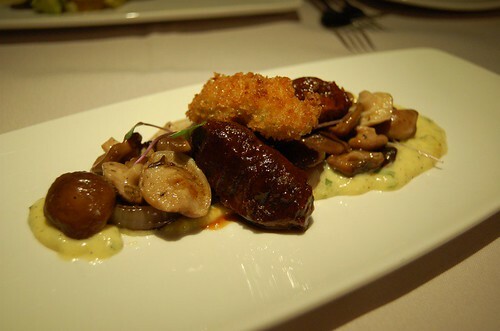 The veal cheek was tender and well flavored, accompanied by some delicate mushrooms and pearl onions. The Béarnaise was surprisingly light, with a healthy dose of tarragon. An auspicious start to the meal. I usually do not order cooked octopus, since it more often than not arrives hard, chewy, and almost rubbery to an extent. This was no exception. 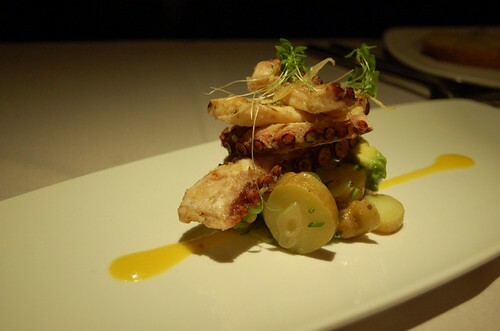 The textures of the dish were pretty interesting though, with the creamy ripe avocados, equally hard fingerling potatoes, and the octopus a la latex. The saffron vinaigrette was not detectable. Do vegetables have panache? 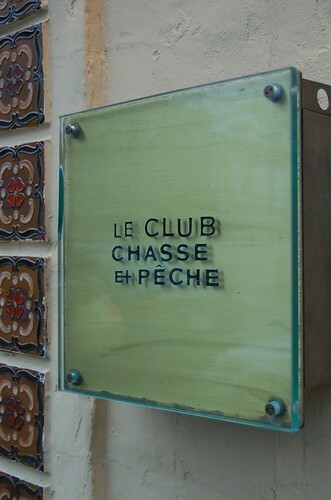 If they're prepared by the French. 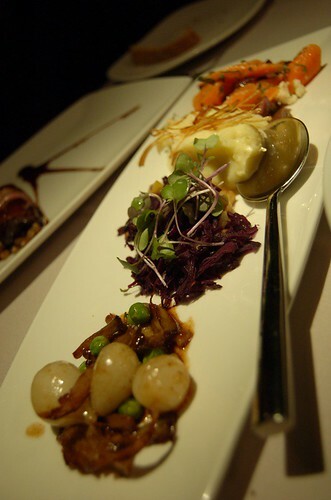 Our server set down the plate and proclaimed it the "world-famous vegetable dish." I thought, seriously? As a lover of all things vegetables, I decided to take him up on this. Four presentations: sauteed pearl onions and mushrooms, cabbage salad, mashed potatoes, carrots with cheese. My level of enjoyment went exactly in that order. The onions and mushrooms were delicious, similar to the sides on the veal cheeks. I wasn't too big a fan of the carrots and cheese. It was cold, not spiced correctly, and it was just an odd pairing of the sweet carrots with the crumbly cheese. The char was perfectly cooked, with a crispy skin holding together the tender flesh. 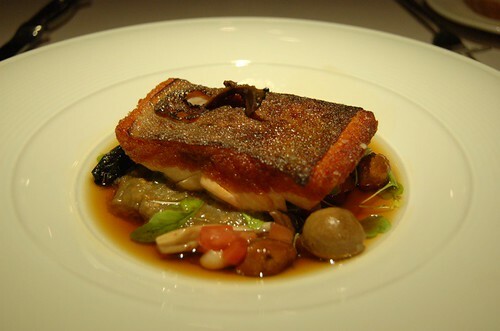 The broth was clear and sweet, uniting the flavors of the mushrooms, eggplant, and tomatoes. It was, however, too salty. As I started cutting into the fish, everything was swimming in a sea of salty broth. 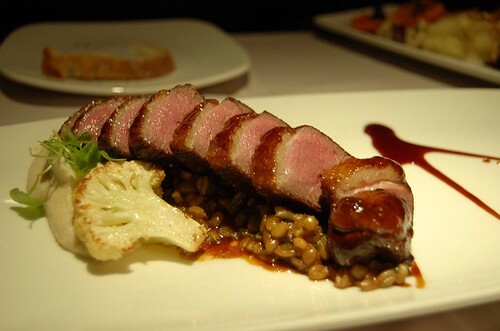 The duck was great - perfectly cooked medium rare, tender, and with a sweet, smoky, Asian-tasting crust. The bitterness of the cauliflower was a well thought out pairing. The faro pasta with duck shreds and the brown honey glaze was once again too salty. The meat + cauliflower paste more than made up for that, though. 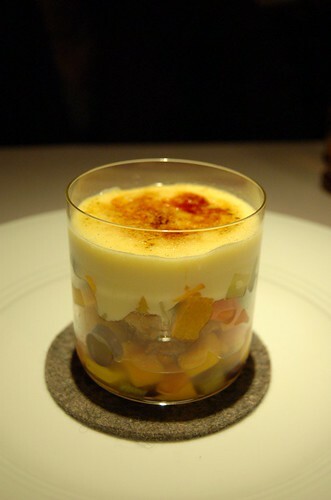 We concluded with a fruit sabayon that had been torched. It was good, but more pedestrian than I had expected. Some fruits other than cantaloupe and honeydew would have been great, given Montreal's abundant supply of fresh fruits. The bread could also have used a more excessive dosage of grand marnier. I think we were trying to relive the memories of the wonderful dessert at L' Entredgeu we had in Paris, but alas, Montreal still is not Paris (albeit with no jetlag). 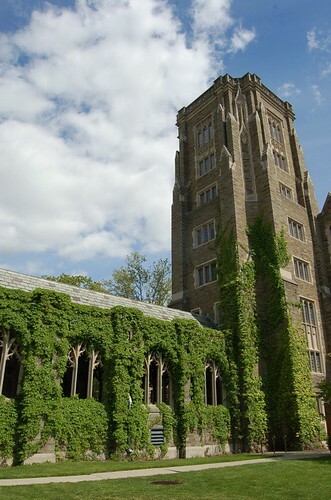 I am officially no longer an undergraduate student. That means I can catch up on sleeping, eating, and blogging*. Edit: *that is, up until the job starts. Friday marked the last day of undergrad classes ever, so a few of us spontaneously decided to go to Montreal. 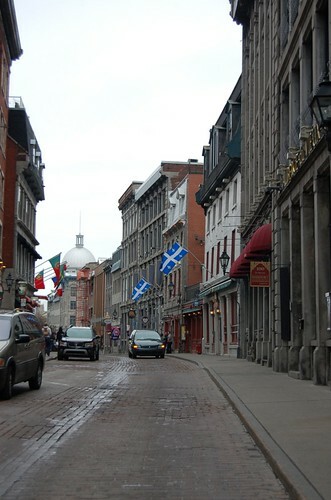 With French as it official language, as spoken by 70% of the population, the city is home to good French cuisine, in addition to some dishes native to Quebec. 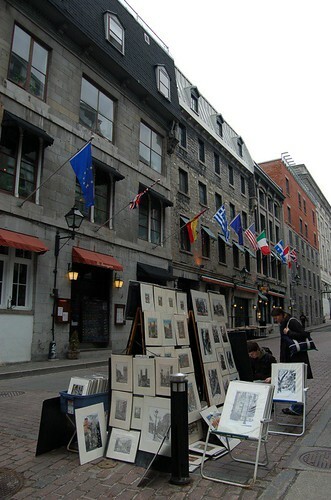 On the first day, we headed to Old Montreal and we saw a sign for poutine. 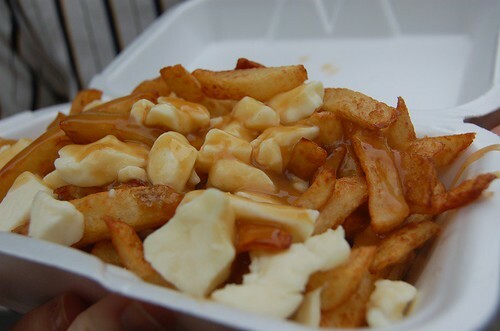 The quintessential comfort food of Quebec, poutine consists of fries topped with gravy and fresh cheese curds. The cheese is supposed to be lumpy and soft, without completely melting over the fries, and the fries are supposed to remain crisp but juicy. They're good, but the tingling fear of an impending heart attack overwhelmed my enjoyment. The city is REALLY clean, but very empty even on one of the busiest weekends of the year (there was a hockey game).